ZoneAlarm, online at ZoneAlarm.com, is one of the leading names in consumer Internet security. ZoneAlarm protects over 60 million PCs from viruses, spyware, hackers and identity theft. The award-winning Internet security product line is installed in consumer PCs and small businesses, protecting them from Internet threats. The ZoneAlarm family of products is among the most popular and successful Internet security products available on the market. Visit 58Coupons.com to learn how you can save with the best ZoneAlarm discounts, ZoneAlarm promotions, ZoneAlarm coupons and ZoneAlarm deals available for ZoneAlarm.com. Save $40 on the regular price of $79.95 for ZoneAlarm Extreme Security and get this great product for only $39.95. Click link today to enjoy this deal. Right now you can save $35 on your purchase of ZoneAlarm Internet Security. Click link to shop. 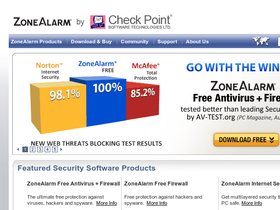 Right now save $30 on ZoneAlarm Antivirus at ZoneAlarm.com, and get it for the low sale price of $29.95. Click link to shop. Try DataLock from ZoneAlarm.com for only 29.95. Click link to shop.